We are extremely proud of our latest prestigious project. 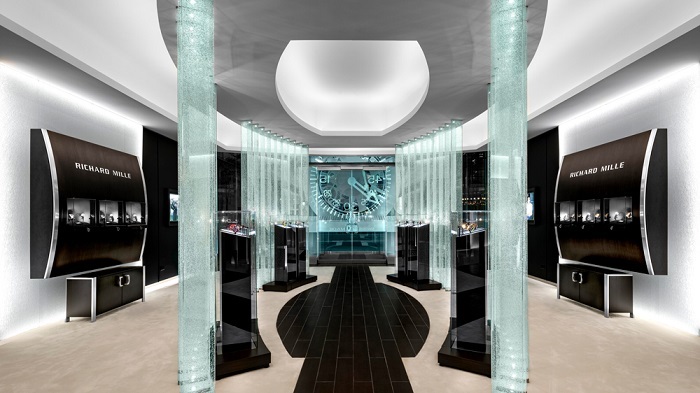 In 2013, Imagic Glass was selected by Viridis Inc. (www.viridis.com), a custom millwork and store fixture company based in Norwalk, Connecticut, to provide custom carved feature glass and triple laminated “cracked Ice” glass for the Richard Mille (www.richardmille.com) brand in multiple locations including Toronto (Yorkville), Miami, Las Vegas, Bal Harbour, St. Barth’s and others. Richard Mille founded his brand of luxury Swiss watches in 1999 and has built his brand on technical achievement, high quality materials and sleek, contemporary esthetics. When building the flagship boutique in Manhattan, the same principles applied. Only something truly exquisite would do. 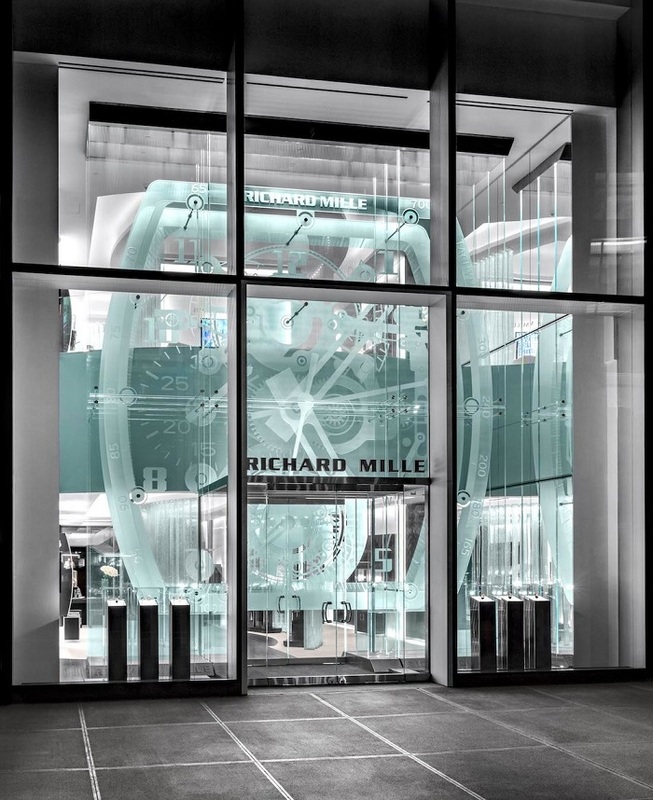 Richard Mille had been looking for a site for their NYC flagship store for almost a decade. They finally identified the ideal site on 57 th at Park Avenue, also known as “Billionaires Row”. delighted by the opportunity to work on such a challenging and fulfilling endeavor. We met with the project team in the summer of 2017 in Manhattan. Richard Mille had hired The Phillips Group Architecture to work with the internal Richard Mille design team, Viridis, and Michilli Inc. (General Contractor). Because of our experience carving the glass for other locations, we were selected to fabricate the carved feature glass for this flagship store. This project pushed all of the boundaries but promised to conclude in a jaw-dropping finale! We knew we would be tested by the size and scale of this project and adhering to the stringent and precise artwork requirements of Richard Mille, but we accepted the challenge, knowing our carving technique is the best in class. Our team can achieve superior visual results and depth with our unique carving technology with the ability to not only etch and carve but to lightly “shade”, to add an element of contrast. Since the largest pieces were approximately 15’ x 10’, over 1.5” thick and weighed nearly 2 tonnes, we commissioned the fabrication of a custom carving line that could accommodate the weight. Some of these carved pieces spent over 160 hours going through the carving line to achieve the desired aesthetic. The end result is astounding. The two-story transparent wall is illuminated by over 150 feet of LED lights, to create a glowing presence at the foundation of the tallest residential tower in the Western Hemisphere. 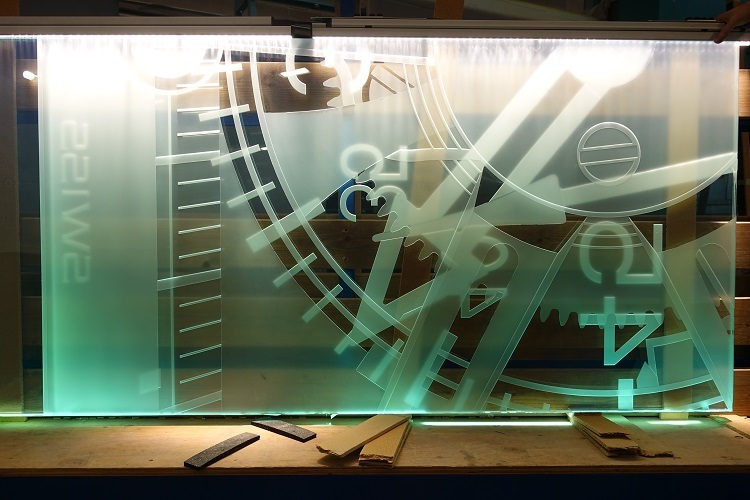 Twenty-four massive panels of glass—totaling 37,000 pounds—are individually engraved and arranged three-deep to form an ethereal sculpture based on Richard Mille’s RM 008 Tourbillon movement. Itself an engineering feat, the façade required the development of metal cladding that could hold the panels in place, including 13 tonnes of glass suspended from the ceiling. 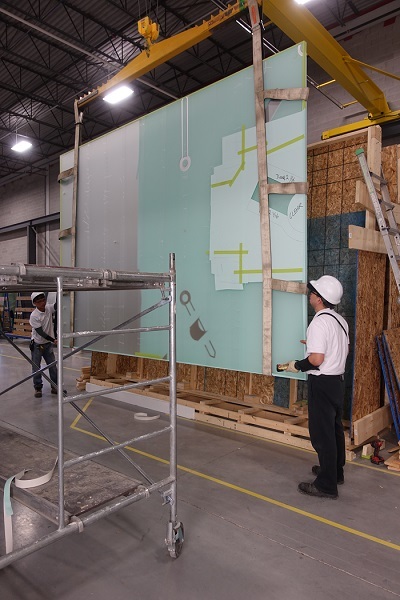 This project is just one more example of why our team is the best in glass. 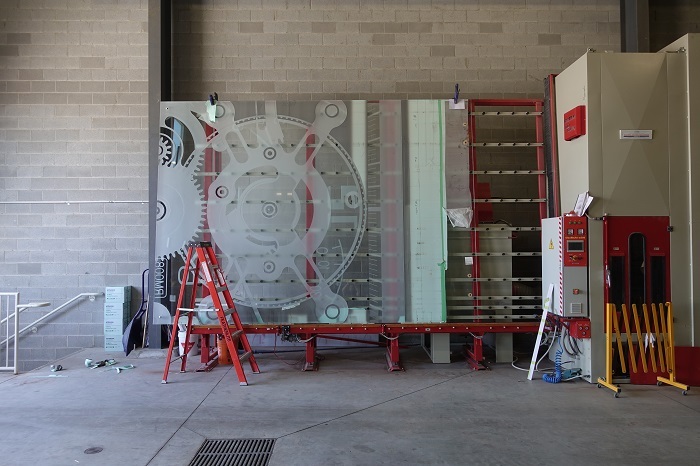 Imagic Glass is your destination for custom architectural glass and mirror. Contact us to arrange a tour of our facility and to coordinate a consultation. Pieces of carved feature glass on IMG carving line. Conducting lighting test and quality inspection at the IMG facility.